This is a post I have been meaning to write for some time, but never seemed to get round to it. So since it is Bloomsday today, I have forced myself to get it out there. What am I on about? Well for those of you that are uninitiated, Bloomsday (16th June) is the day that James Joyce fans celebrate his (and possibly the) greatest book – ‘Ulysses’. Why is it so good and why does it garner so much attention? Well, personally I think Ulysses is not only the greatest book ever written, but also the Slowest (‘In Search of Lost Time‘ coming a close second). Not much has been said (or written!) 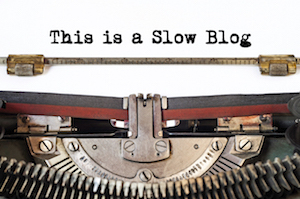 about Slow Reading – Slow Reading is appreciating the written word, savouring the sentences, appreciate the structure, rather than rushing to get the book finished. It is the antithesis of Speed Reading – skimming and rushing through as many books as we can. We are all so obsessed with getting books read as quickly as possible so we can move onto the next one that we rarely think about reading slowly and appreciating what we have. The internet is cluttered up with blog posts, articles and videos telling you how to increase your reading speed and read hundreds of books a second, very few are about how to appreciate the written word. Of course, speed reading has it’s place, but when you are reading a novel that the author has sweated blood over wiring it is only right an respectful that we take the time to appreciate their craft. We don’t have speed Opera listening or speed looking at art (or maybe we do? ), we don’t watch classic films at double speed, so why are we so obsessed with reading as quickly as possible? James Joyce hated the idea of people speed reading his work and filled it full of linguistic tricks and grammatical gymnastics that forced you to slow down, to actually pay attention to what he had written. In Ulysses, he changes writing styles depending on the content and context of the chapter; two (Proteus and Penelope) are written in that stream of consciousness way in which we think, capturing how our thoughts jump around and make random associations. In Eumaeus, the chapter in which Stephen and Leopold get drunk, the point of view of the writing is deliberately confused to give you the impression that you, the reader, is a drunk too. One chapter (Circe) is written as script for a play and one (Aeolus) is written in short newspaper headlines You really do need to pay attention to flow of what and how he is writing. No skimming here, that would be utterly defeating the point. He wanted you to be a flaneur of a reader, to stroll through the book, to take your time and appreciated his work., in much the same way the characters stroll through Dublin. So what is the book actually about, and why is it the worlds Slowest novel? On the surface it is just a record of a perfectly ordinary day. The book tells us about one day (16th June 1904) in the life of three people; Stephen Daedalus, Molly Bloom and, in particular, her husband Leopold. It follows them through a day in their home city of Dublin. Every aspect of life is covered; Leopold, for example, bathes, uses the toilet, attends a funeral and birth, gets drunk and visits a brothel. Ulysses is a complex novel and there are people much clever than me who have dedicated their lives to studying its secrets, and it can be interpreted in many different ways. Personally I read it as a celebration of the ordinary. Ulysses it tells us that, like the Greek hero Ulysses, we are all livening our own Odyssey every single day. Each day of your life is a unique adventure if you look at it the right way. It reminds you that you life, no matter how ordinary, is extraordinary and every experiences in magical and unique. We do not need to travel to exotic locations or be involved in outrageous activities; every day of our little lives is an odyssey akin to Ulysses’. I have written a detailed “Readers Guide” on my other blog here for those of you that have been inspired to read it!